One of the reasons we camped at Big Basin Redwoods State Park was to do the hike to Berry Creek Falls. We had done this hike once before years ago. We had thought about doing it again and since we got plenty of rain this winter we thought it would be a good time. 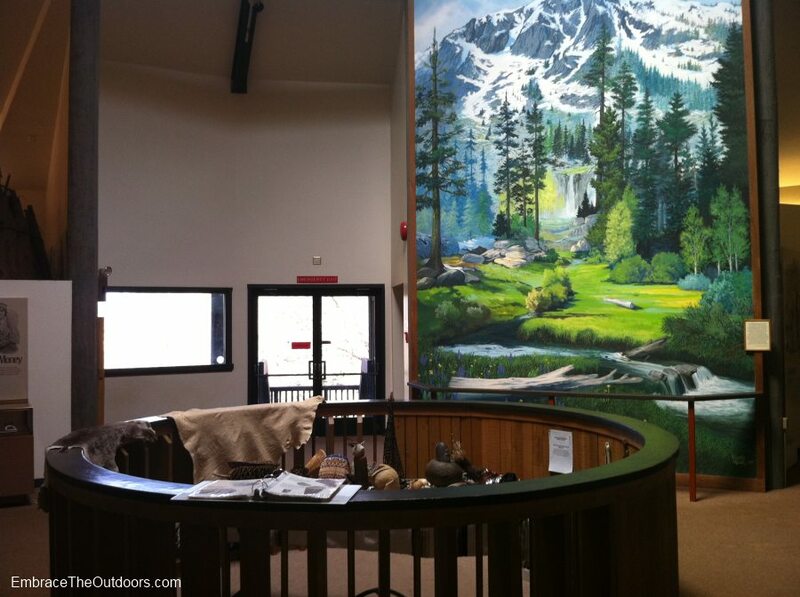 We made the short drive from our campsite at Huckleberry Campground to the park headquarters. It was just before nine in the morning and the parking lots were already filling up. There is a day use fee of $10 which is waived for campers. 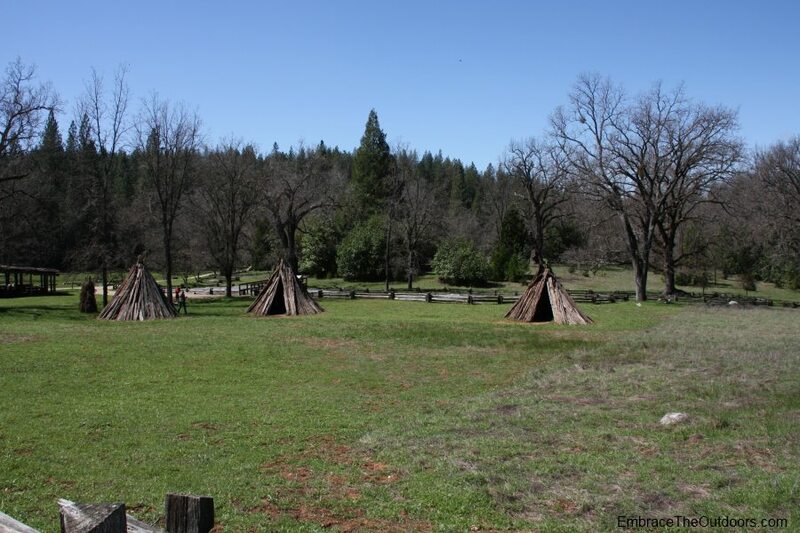 We parked by the Redwood Trail sign and followed the path to the left of the Campfire Center. After passing the only restrooms we would see on our hike, we crossed on a bridge over Opal Creek. The trail split at this point with the left leading to Skyline to the Sea Trail and the right leading to Sunset Trail. Either direction would have worked for the loop hike but since there was a sign to the left warning that part of Skyline to the Sea trail was closed we went right towards Sunset Trail. The trail was broad and fairly flat at this point. After following along the creek for about half a mile we came to the junction for Sunset Trail. Aside from trails signs, we also saw signs that there was a trail race taking place that morning with distances ranging from 10k to Ultramarathon. We headed left onto Sunset Trail and followed the path as it began to climb. It wasn't long before we came upon another junction which is a connector trail to Skyline to the Sea Trail. We took this connector trail on our way back from the falls but for now we continued onto Sunset Trail. 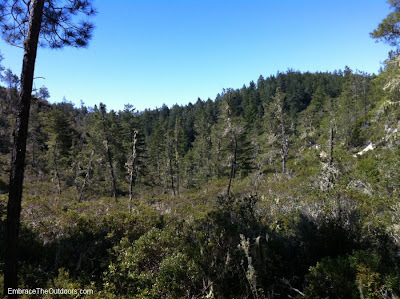 The path was mostly shaded for several miles due to the surrounding Redwood trees and there was constant elevation change from this point forward. We passed a few banana slugs and we also came across several runners headed in the opposite direction. 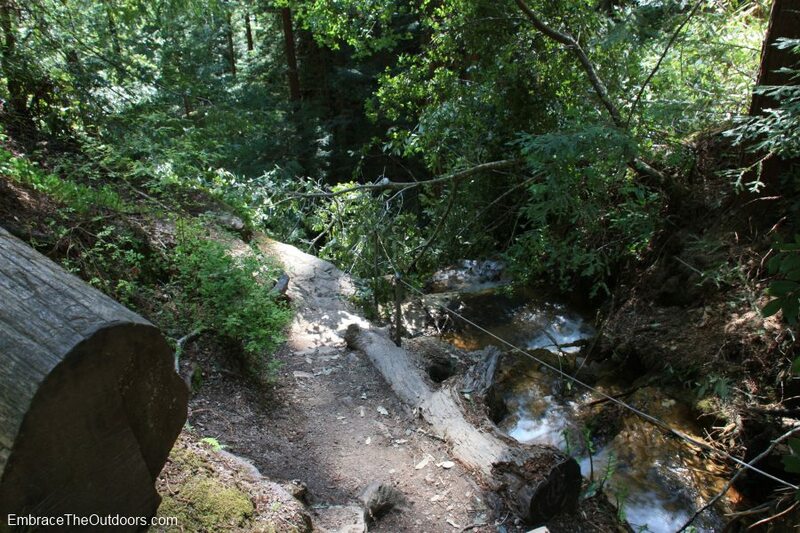 After nearly five miles the trail headed out of the shade of the large Redwoods into an exposed rocky area. It felt like we had stepped into a completely different park. There were nice views of the trees and other foliage but with the sun directly on us we were anxious to move back into the shade. Luckily we were able to do so after about half a mile, when the trail became Berry Creek Falls Trail. We could hear rushing water and knew we were close to the first falls. 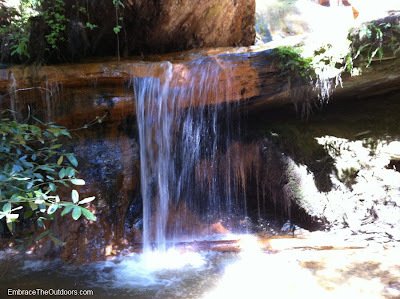 We continued as the trail descended and soon were able to see Golden Falls. There were several places to get a good view of the falls and although there were a couple of groups there at the same time it did not feel crowded. 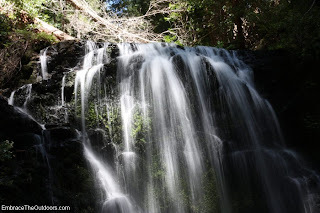 We took our time admiring the beauty and taking several pictures before heading back on the trail to Silver Falls. Silver Falls is actually connected to Golden Falls but we weren't able to figure out exactly where one ended and the other began. The path really narrowed here as it was alongside the edge of the cliff. There was a guide wire to the right that we recommend using since the rocky path is slippery here. Back on a dirt trail we caught our first glimpse of the magnificent Berry Creek Falls. We descended until we came to a viewing platform. 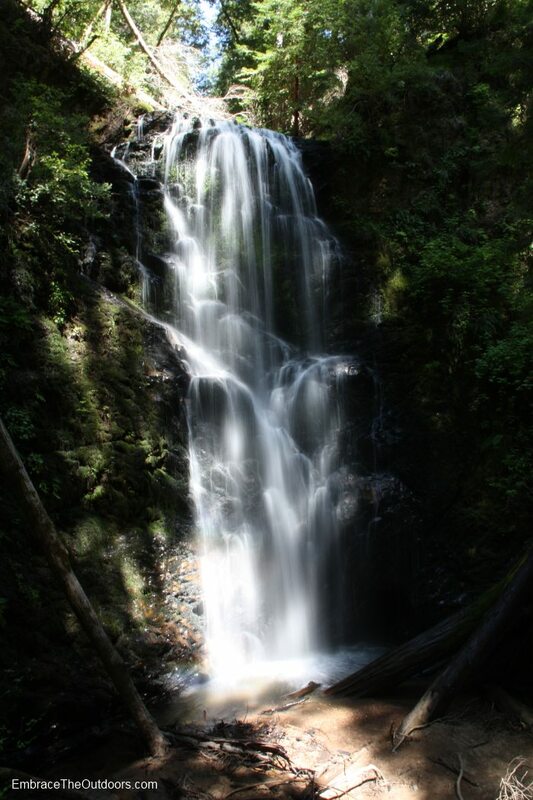 We were lucky that there were just a few people there when we arrived so we were able to get a good view of the beautiful falls and take some great pictures. Being about halfway through the hike we were definitely hungry and decided to take our lunch break here. There was a bench on the platform but since it was taken we sat right on the platform itself. Great place for a break if it is not too crowded. Re-energized we got back on the trail, crossed over a creek again and made our way up to another bench which also has a great view of the falls. We took a few more pictures and then made our way back onto Skyline to the Sea Trail. We were met yet again with constant elevation change but at least the rest of the hike back was shaded. At about the nine mile mark we came across the connector for Sunset Trail which we were forced to take as Skyline to the Sea Trail was closed beyond this point. Once back on Sunset Trail we retraced our steps back to the parking lot and our car. We finally were back to the full lot after about 11.5 miles. The hike took us about five hours, including breaks. With all of the water fall this year it proved to be a great time to do this hike. We definitely recommend it but keep in mind that it is a strenuous hike with constant elevation change adding up to about 2000 feet overall. Be sure to give yourself plenty of time to complete it. 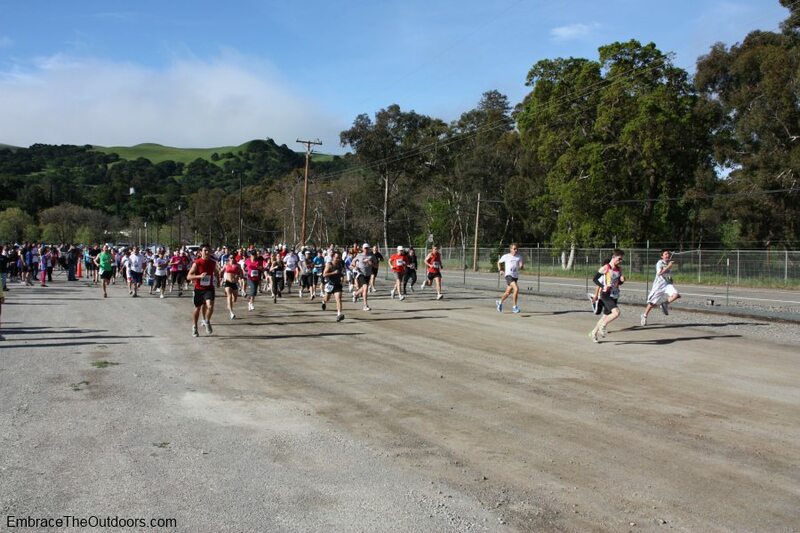 It was the inaugural Run for the Parks race in Livermore on April 17. 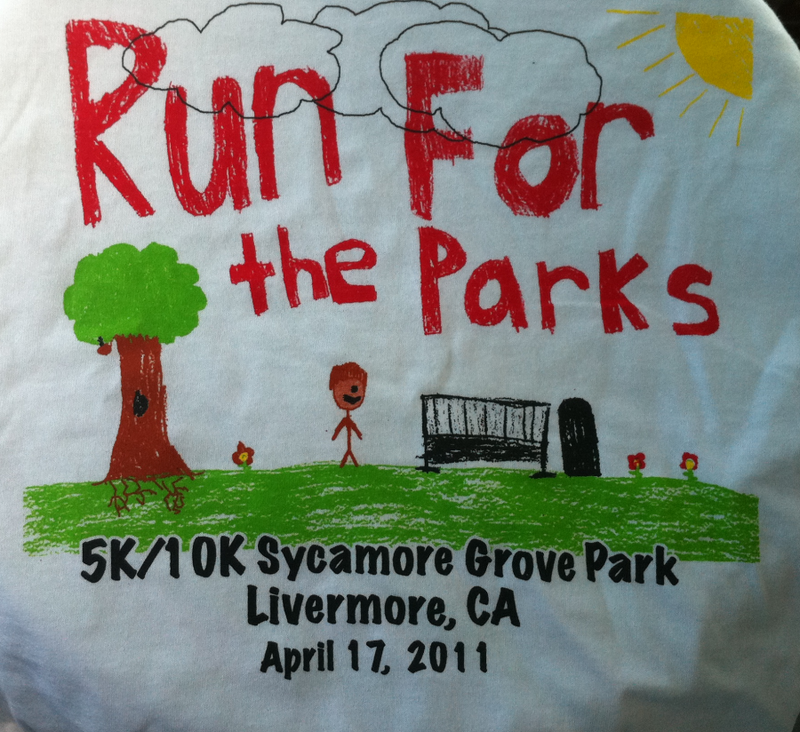 The race took place at Sycamore Grove Park and since it was a trail race I signed up for the 10k. 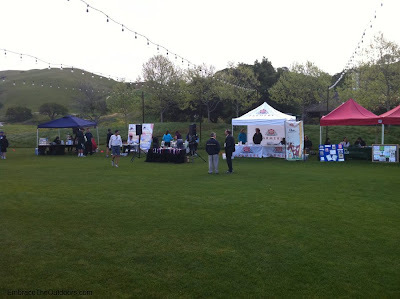 There was a 5k and a kids one mile race as well. Race fee was $30 and included a race shirt and limited post race snacks. The proceeds from the event benefited the Livermore Area Recreation and Park District (LARPD). Parking was initially supposed to be at a park just north of the start but it was changed last minute. It was moved just over two miles away. This last minute change caused undue pre-race stress and a significant delay in the race start. There were signs to direct everyone to the new parking area, a large dirt lot at Wente Vineyards. Parking was much more adequate here than it would have been in the original location. Race bib pickup was on a large lawn and consisted of long, slow moving lines. Each person had to sign a waiver before picking up their bib. I waited about 15 minutes to get my bib and once I was up to the front of the line there was chaos in trying to find bibs for everyone. Since the alphabetical signs for bib pick up were not easily displayed people were in the wrong lines. 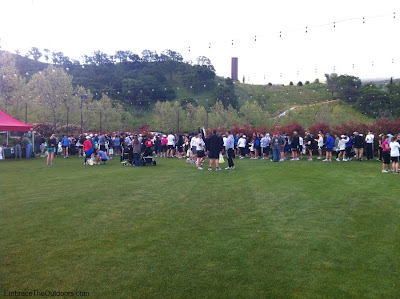 Overall, the race planning for bib pick-up and parking was very disorganized. Also on the lawn were a few booths including one for LARPD. There were a few porta potties here and two more closer to the race start/finish which I thought was a good idea. I made my way towards the start and and after waiting for several minutes it was announced that due to late arrivals and long check-in lines the race would start about 25 minutes late. The 10k race started at about 9am instead of 8:30am. 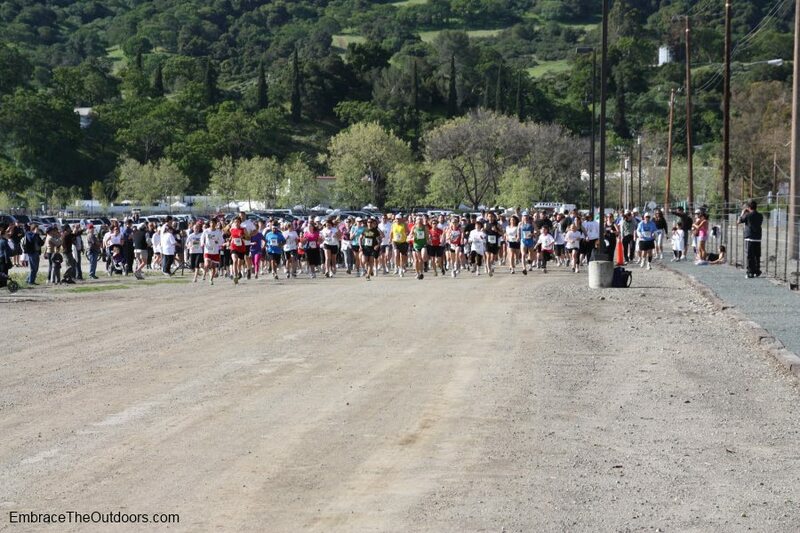 The route had a short part on gravel while on Wente grounds then went across the street into Sycamore Grove Park. It was a dirt trail once in the park with small rolling hills. At just under one mile there was a "creek crossing". At the race start we were warned that our shoes would be wet, which many of us were not happy about but once there I was able to jump across the running water without too much effort. The dirt trail then separated into two lanes with a small patch of grass in between. The trail itself was uneven, which is expected for a trail run. There were volunteers at each place where the route turned and the road itself had chalked arrows to make the race route very clear. There were mile markers at every mile as well. 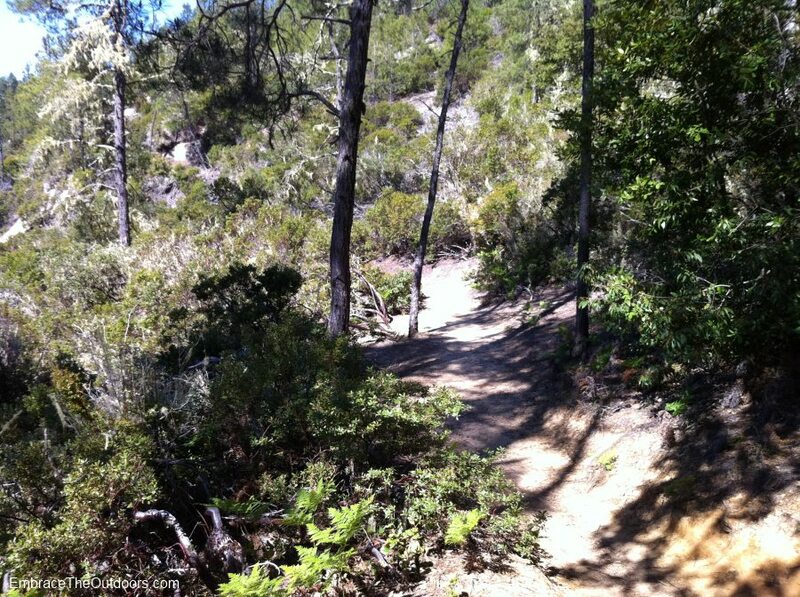 As we got closer to the north entrance of the park the trail went onto a paved trail. At just under the three mile mark there was a water station that was surprisingly manned by only one person. At this part of the route the trail looped around for about a mile, passing the water station again. The route then had me retracing my steps on the dirt road before taking a different path back towards the entrance of the park. 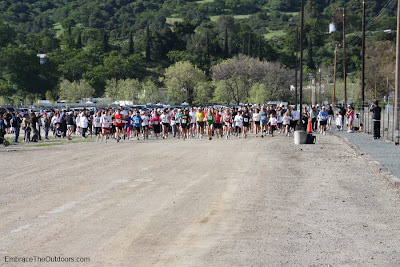 After crossing the street and running on the gravel again I reached the finish line back on Wente Vineyards grounds. There was ice cold water bottles available at the finish which was so refreshing since the sun was out and it was starting to warm up. Heading back to the lawn there were some energy bars and muffins. There was also a booth that had cupcakes and other sweets for sale. Race awards did not start until after 11am since everything was delayed. There were about 400 participants in total. The race location and course was great but because it was so disorganized I am not sure I would do it again. Having spent the morning at nearby Daffodil Hill we decided to stop at Indian Grinding Rock State Park on our way home. The park is located just Northeast of the town of Jackson right off of Highway 88. 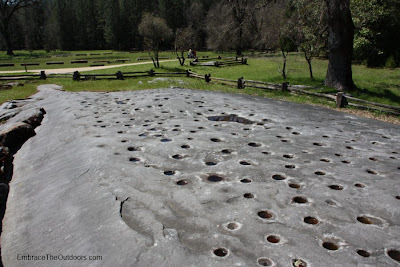 It preserves the largest collection of marbleized limestone with mortar holes in North America, hence it's name "Grinding Rock". After paying the $8 fee we parked in the large day use parking lot. 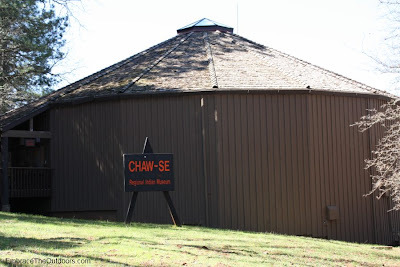 We started at the Chaw'se Regional Indian Museum which showcases various Native American artifacts and information. There was a Native American version of a drill to try out which was fun. Souvenirs and books were available for sale as well. After visiting the museum we walked behind it to the main path in the park. We passed a sculpture of a Miwok dancer and three bark houses before getting to the grinding rock and petroglyphs. We had trouble finding the petroglyphs on the rock and had been told earlier by a museum volunteer that they are difficult to see. Continuing on the path we saw a large game field that is still used by Native American youth groups and a large picnic area that is open to the public. 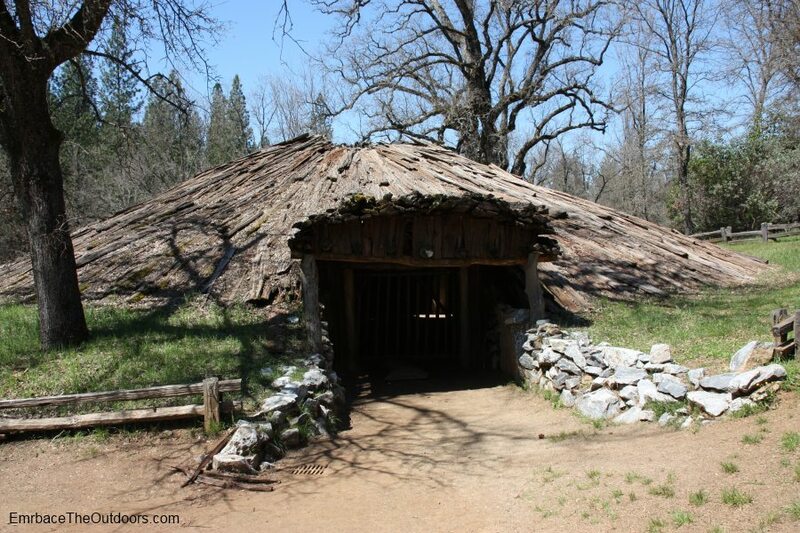 Next came the Ceremonial Roundhouse which is used several times a year by local Native Americans. We were only able to catch a glimpse inside since the entrance had a gate keeping people out. At this point we could have continued on to the South Trail but decided to head back. The South Trail is a half-mile long self-guided nature trail. 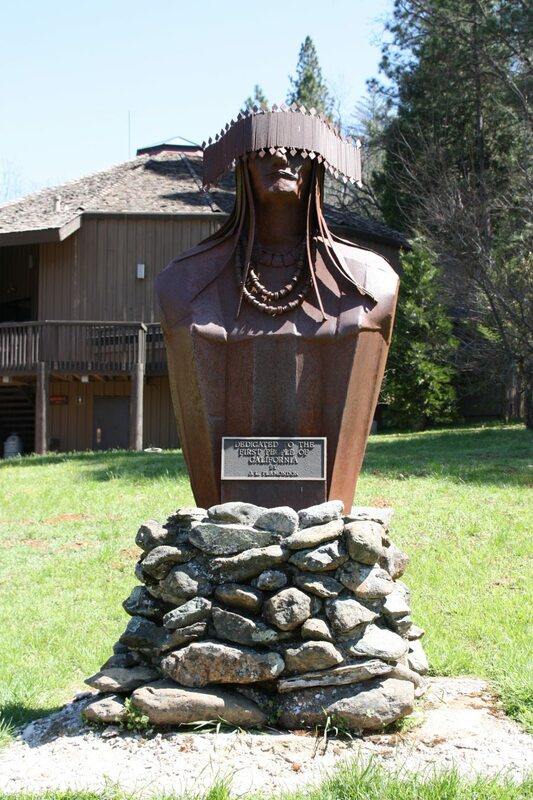 There is also a North Trail which is a one mile loop that starts near the museum. It passes through an old farm site, crosses a creek and continues to a reconstructed Miwok village. Indian Grinding Rock State Park also has a campground. Sites are available on a first come first serve basis for $25 a night. 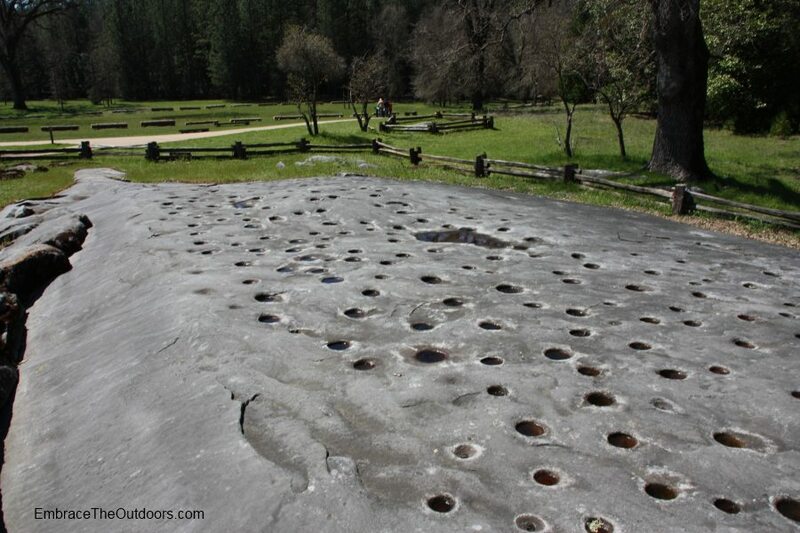 Since the park is in the lower Sierra foothills it does get some snow so the 22 site campground is not open year round. 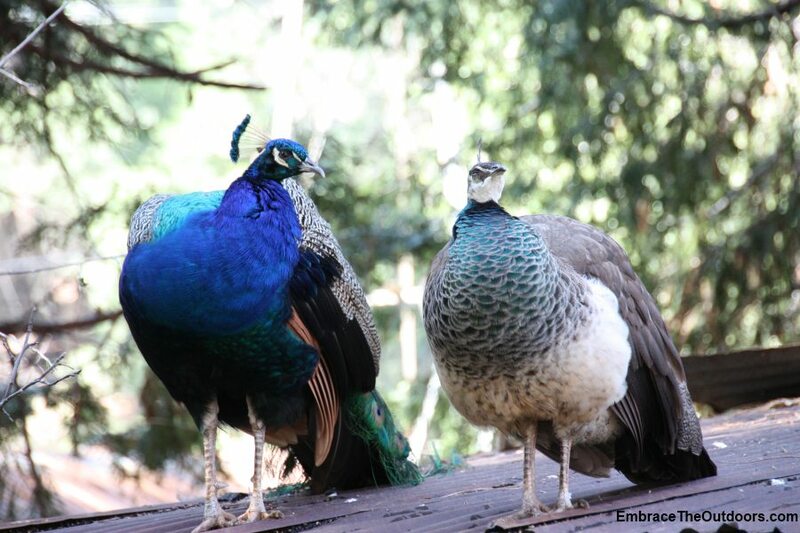 There are flush toilets and shower facilities available at the campground. 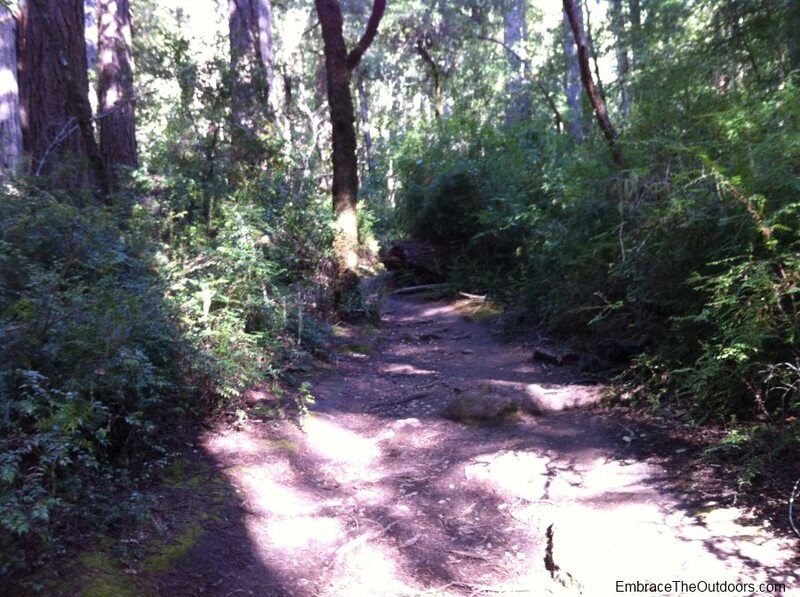 We plan on returning to the park to camp and to explore the trails. We were lucky enough this year to hear about the opening of Daffodil Hill and had a free weekend to go check it out. 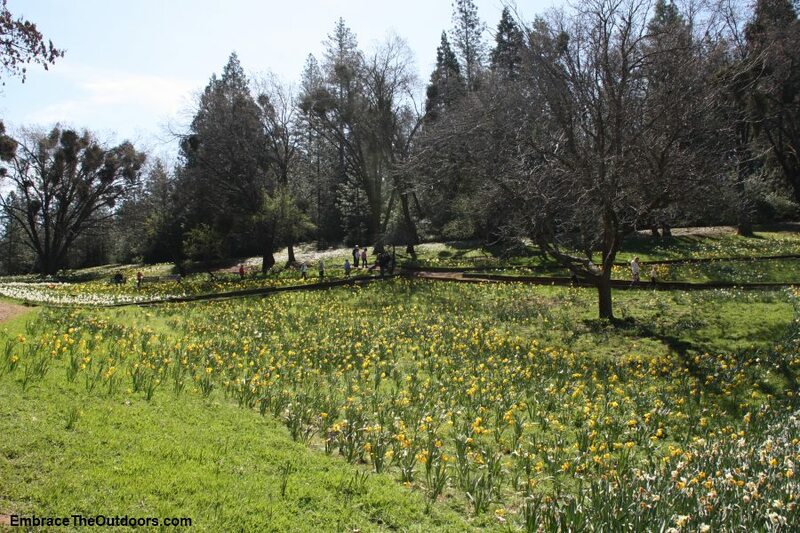 McLaughlin's Daffodil Hill Ranch is a four acre farm privately owned since 1887. 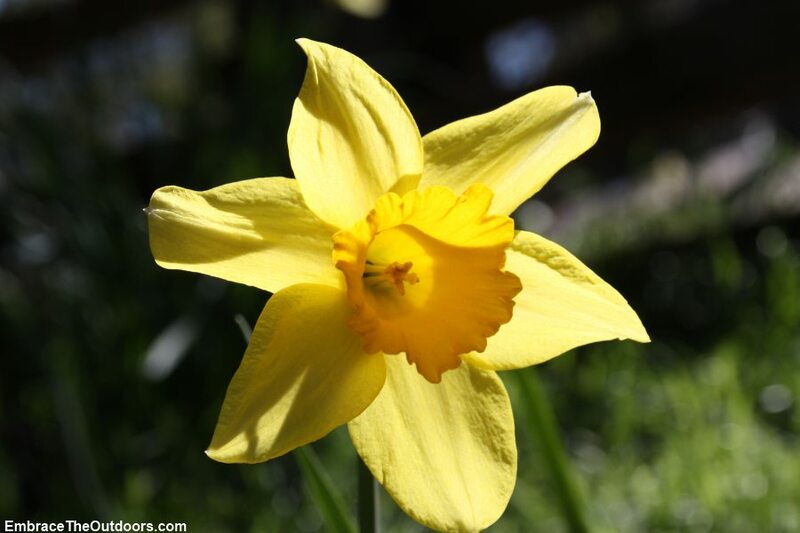 Each year, usually in late March over 300,000 daffodil bulbs bloom. The 300 varieties of daffodills and numerous varieties of other flowers make for a beautiful landscape. This beauty lasts for only a few weeks, depending on the weather. 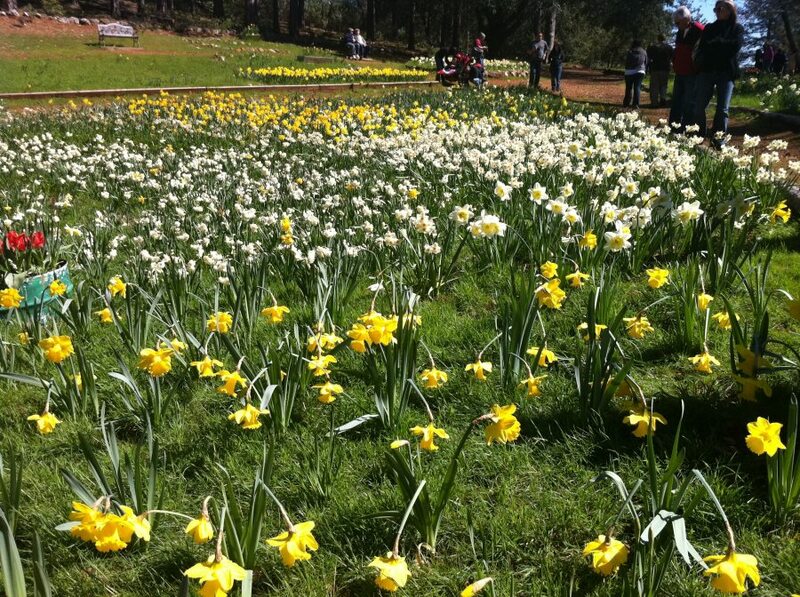 It's during this time that Daffodil Hill is open to the public daily from 9am-4pm. 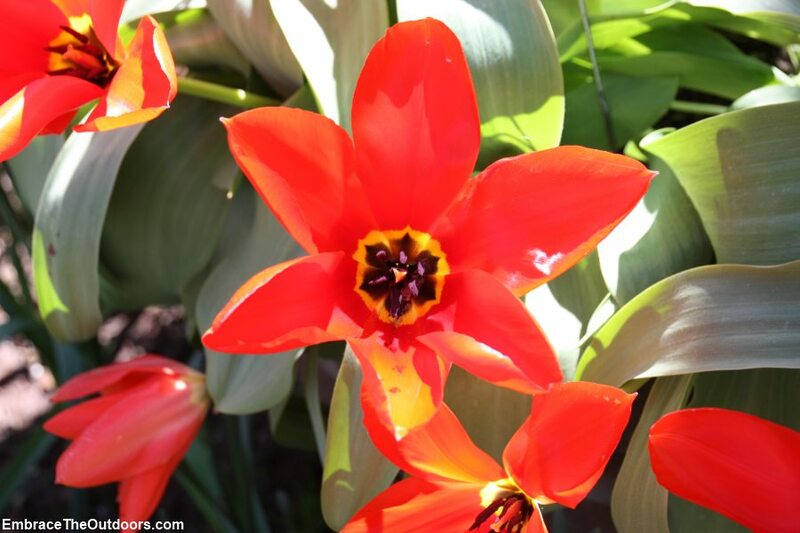 It opens when 25 percent of the flowers are in bloom and closes when only 25 percent remain. Days of operation are dependant on weather so it is recommended that you call before heading out there. 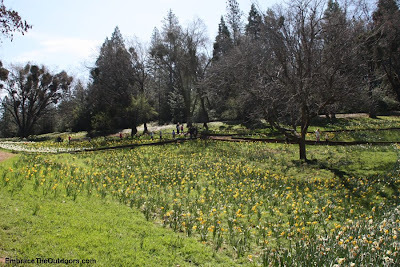 Daffodil Hill and the surrounding area had gotten some snow a few days before we were planning to go but luckily the sun dried it out in time for our trip. 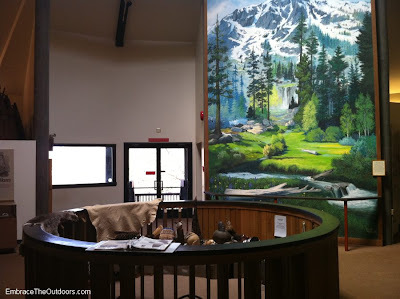 We headed out on the road, passed the town of Jackson, drove through the small town of Volcano and through a few miles of winding road before reaching the ranch. Employees directed us on where to park. There were several dirt parking lots. We walked back towards the lot entrance and walked across the street to the ranch. There was a California Highway Patrol officer directing auto and pedestrian traffic, making it easy to get across. As soon as we walked on the property we saw numerous beautiful bright flowers. There was a barn to the left and a small souvenir shop on the right. There were paths that looped around the hill and as we passed the first one we across a bright colored peacock just walking along. We were able to get some nice pictures. Walking down the main path towards the hill we came across a horse, chickens, rabbits and more peacocks. There was also old farm equipment along the walkway. 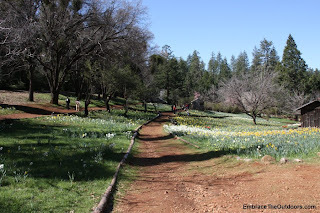 We walked on one of the smaller paths that leads to the hill and saw thousands upon thousands of flowers. It was amazing. We slowly made our way around the hill taking lots of pictures. We could have spent hours there just taking pictures of all of the different flowers. 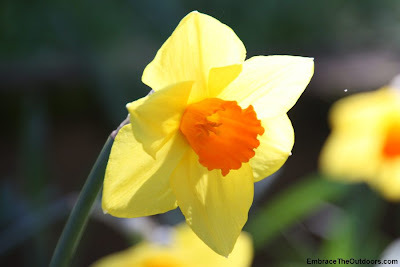 The sheer number of flowers was impressive and the bold colors were mesmerizing. Having walked around the entire loop we ended up at a picnic area near the entrance. Across the street from the ranch was a snack bar operated by the Soroptimist Group.We walked across the roadway back to our car and headed back. The McLaughlin Daffodil Hill Ranch is a place everyone should visit. The staff were friendly and well organized, there were porta potties on site, and snacks nearby. But the most important thing was that the flowers were amazing. We look forward to next years visit.